Focus on unlocking a human therapy, using good science, with a 10-year horizon whenever plausible. 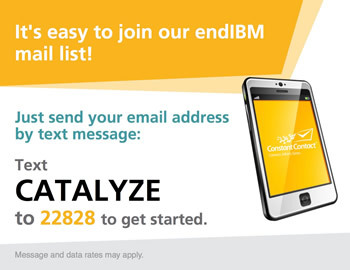 Join the endIBM email list. Your source for happenings, advances and invitations to help Catalyze a Cure for friends afflicted with inclusion body myositis. What if we patients and friends asked six knowledgeable medical scientists from five reputable institutions to identify those few research questions that have the highest potential to lead to an ibm treatment or cure? You’d get an ibm research ‘roadmap' seeking the shortest 'street' from here to a life-improving medicine. What if you seeded the pursuit of the roadmap with pledges of a few hundred thousand dollars – and then made every effort to raise millions of dollars to advance from mile-marker to mile-marker on the ibm-cure roadmap? Stay tuned, that work is now underway! And, we really need your help! Donate to accelerate a treatment for ibm. The directors are paying Foundation expenses again for 2018, so virtually all of your investment goes to medical research! What is inclusion body myositis, or "ibm?" Click for a patient-like description; more technical resources will be posted soon. © Catalyze a Cure Foundation. All Rights Reserved.